Ordinance No. 11, Series of 2013 - Cheer zone Ordinance Zipline. Ordinance No. 15, Series of 2011-Anti Trafficking Ordinance of Vigan City. Ordinance No.14,Series of 2005 - Giving Monetary Reward to Deserving student athletes in Vigan. 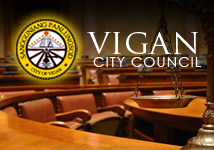 Ordinance No.15,Series of 2006- Vigan City Sports Development Ordinance. Ordinance No.23,Series of 2005-regulating elem. students and minors.